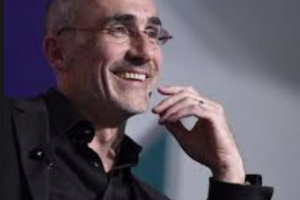 Arthur Brooks, President of the American Enterprise Institute, delivered insight and inspiration at this year’s Principled Entrepreneurship and the Dignity of Work conference in Washington D.C., and orchestrated by the Napa Institute. But I was intrigued not only by Brooks’ talk, but also by the reaction of the young Catholic professionals at our table, as you’ll see below. For this talk, I found myself at a table of young professionals. Among these was Juan Pablo Segura, founder of a successful start-up called Babyscripts which offers prenatal and postpartum care and is working to transform how both doctors and patients use technology to improve the care of expectant mothers. Since Brooks’ talk was titled “How to Live a Start-Up Life,” I was particularly interested to hear Segura’s reaction. “Arthur did an incredible job of explaining the ‘why’ of business and of work,” said Segura. While we often do things mindlessly, he continued, Brooks reminded his audience that mindful living is the first step towards sanctifying our work — and thereby sanctifying our lives. Brooks connected this idea to our cultural identity. An organization that is doing great work in developing this cultural principle is The Prison Entrepreneurship Program in Houston, Texas. This organization, founded by evangelical businessmen, combats the high reoffending rate which is correlated to difficulty finding work. The program gives participants entrepreneurial skills so that, upon exiting the prison system, they are ready to start their own companies. When Brooks visited this organization, he learned of its high success rates: the re-incarceration rate of participants is below 7%, compared to the national U.S. average of almost 50%. But this success, says Brooks, is not because the majority of participants do in fact start the companies they were trained to start and run. As it turns out, the entrepreneurial training inmates received at The Prison Entrepreneurship Program helped them to understand their lives, and this helps them to reintegrate into society. Brooks used this story as an anchor for two practical recommendations. His second practical recommendation was to use your weaknesses to make yourself truly successful. Contrary to what high school guidance counselors may tell us, said Brooks, it’s our weaknesses rather than our strengths which are in many ways the key to success. Brooks recounted how he discovered this truth. He took an unconventional path through life. As a college dropout, a traveling french horn instrumentalist, and an eventual graduate of a correspondence school, Brooks was ashamed of his educational background until his 2013 editorial in the New York Times revealed a shift in his mindset.